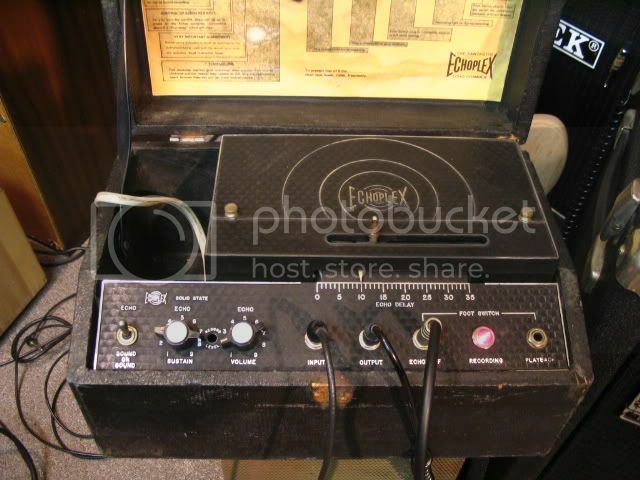 What to know about buying an Echoplex? Yeah I've done the reel to reel thing. It sounds great. I'm interested in the Echoplex for all the irrational reasons discussed in this thread. Thanks Fred. I've enjoyed your videos on Instagram. I don't suppose you want to donate your spare Echoplex to a lonely geologist in Mississippi? I’d love to lend it you if you were in driving distance. But alas Miss is a bit too far away. I hope you get that EP3. The preamp quality is the special sauce. Hopefully it’s in good working order. Let me know if you need any help/advice when you get it. As Bo Diddley said “Toin’ it up”. I’ve still got my reel to reel. Only used it for recording thou. The sound on sound worked when I got it serviced but I can’t figure out how to get it going again. There’s one on reverb . They look amazing! THAT is one cool box, don't believe I have ever seen one of those or I would have already had one, wow, great thread !! FedEx literally smashed the box it came in, so I got the full dose of rebuilding an Echoplex as soon as it arrived. Luckily the wood cabinet absorbed the worst of it, so I only had to remount the motor, reattach the circuit boards, and respool the drive belt. I still need to reassemble the cabinet, but FedEx covered the full value so I don't mind so much. Free Echoplex is Best Echoplex. That gave you an intimate knowledge of the mechanics of the thing, which you were anxious for anyway. But a pox on FedEx, huh? Well at least FedEx covered the full insured value. The seller had them package the item, so they took full responsibility. And yes, I got intimate with the mechanics, which I probably wouldn't have done for years otherwise. It's not terribly complicated, I'm just glad the electronics are intact, as they're considerably more intricate. All's well that ends well. The worst of the damage was the cabinet, which I can fix well enough. Credit to the design, realigning the motor mounts was easy enough, and now it runs like a top. Hey, Otter! How’d this turn out? I missed the second half of this thread. That's unfortunate that the box was damaged in shipment. One of these days, probably after Easter, I'll start a thread on the electronic hacks made recently to my EP-2 which has resolved the fundamental problem with an Echoplex. I just bought a klemt echolette .... unfortunately it arrived and is a lil distorted,,, but perfect physical condition so hoping it is just filtecaps. The EP3 was the best model...unless you like the distortion you get from the tube models. Replace the filter caps and clean the heads & guides with alcohol. Buy a new pinch roller and new tape cartridge. Since we are here and because I would probably not bother, I might as well do it now. 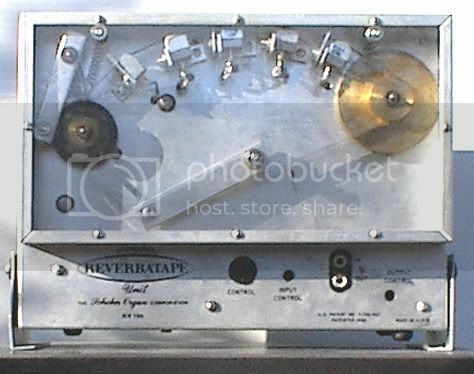 First, we keep in mind that the Echoplex has two separate things going on, (1) its preamp and (2) its delay effect. The fundamental problem is that the design is for the tape always to be rolling. This wears out parts, the heads, the rollers, the tape. So what I've done is had the useless sound on sound tape head removed--which imediately reduced the warbling. Then, the next modification was to change the circuitry such that when the EP is turned on, the tape no longer rolls--so only the preamp is in play. To get the standard tape delay effect and the mechanical parts rolling is now accomplished by turning on the sound on sound switch. 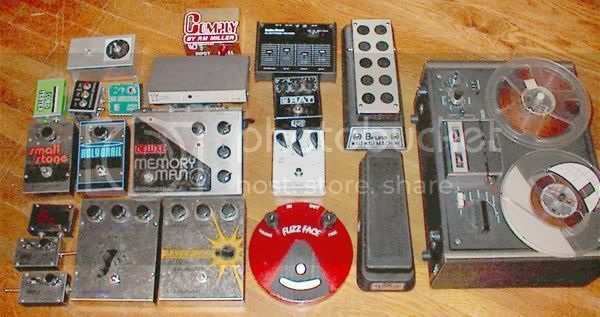 Nothing sounds like a properly working Echoplex preamp (and per the kudos for the EP-3, e.g, from BZ among others I would like to pick up one of those as well)--now I can play mine with impunity and not have to have anxiety about the heads, tape and parts wearing down from the motor functions (and having to constantly clean and demagnetize them), and turn on the delay system from time to time only when I want it rather than having it run constantly. __ Regarding your Echolette--sorry to hear this. Hopefully you are correct in your diagnosis. What helped my process with the EP a lot was having two of them side by side for comparision. When some aspect of one sounded better than the other this could be isolated and the worse sounding one getting electronics matching the better sounding one. Great advice. Also, get a degaussing tool to demagnetize the heads. Needed on anything that uses recording tape. Alcohol is a great cleaner, but NOT rubbing alcohol. Use pure 200 proof ethyl alcohol.